The video was filmed Tuesday 19 December at a police academy in Tartous, a town in northwestern Syria, during a ceremony celebrating the end of a 45-day training programme. The Minister of the Interior was in attendance, ready to offer his congratulations to the 100 police officers graduating from the programme. The gruesome video shows five Syrian policeman using their bare hands (and sometimes their teeth) to kill live animals. Since it was first shared on December 19, it has been watched by several thousand people. 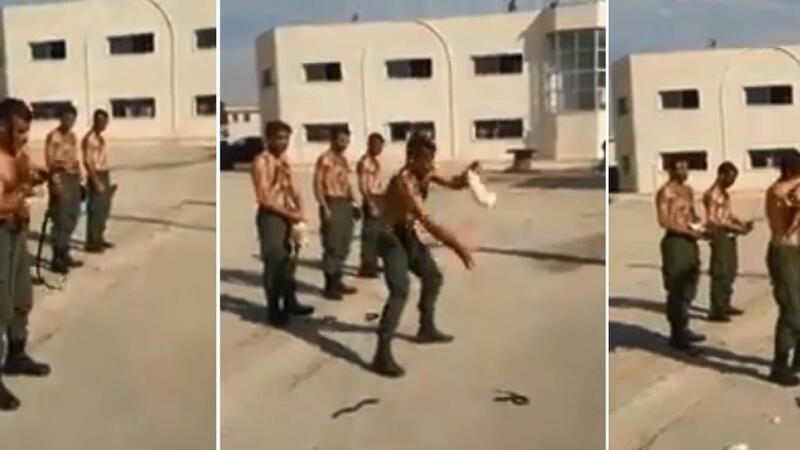 Many were horrified by what they called the “barbarity” of the Syrian police force but, as it turns out, they are far from the only army to use these brutal training methods. One of them knocks a chicken out by striking it against his leg. Despite the violent nature of this footage, excerpts of the videos were broadcast on the news on the Syrian television channel Sama (at the beginning of the amateur video, you can see a professional cameraman filming the same scene). After watching the video, many people took to social media to express their shock or horror. Some made dark jokes about how the Syrian police officers were so “in touch with nature”, while others insulted them, calling them “underdeveloped”.